Nobody loves cookies more than Cookie Monster! Features the Sesame Street star's likeness and a big cookie! Includes a silicon freshness seal and hand painting that enhances the details. Nobody loves cookies like Cookie! 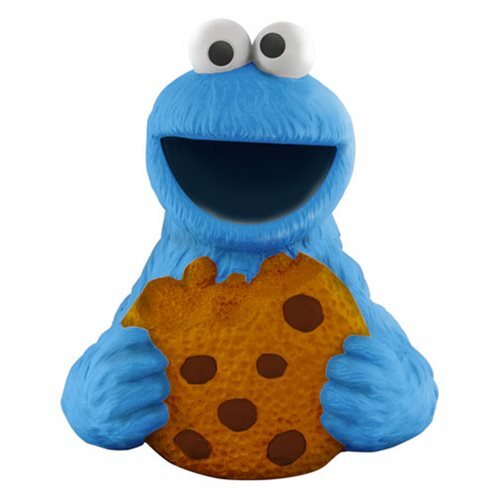 From kitchen to home organization to a fan's favorite conversation starter, this highly entertaining and uniquely crafted Sesame Street Cookie Monster Sculpted Ceramic Cookie Jar can be used to hold all kinds of household items… but Cookie might have something to say about that. The unique custom-sculpted design boasts a silicon freshness seal and hand painting that enhances exquisite details and measures approximately 11 1/4-inches tall x 9 3/4-inches long x 9-inches wide. Featuring the Sesame Street star's likeness and a big cookie, it comes in a full-color gift box.